We just got a new Thor 23TB Class C, and I was shocked to find it come with NO spare tire, not even has a place for one! Seems like one would be in a tough spot, if one had a tire go bad in the middle of nowhere, w/o a spare! So I picked me up a steel hitch mounted rack ($32 total price), to carry a spare tire (w/o rim). It was made for off-road 4-wheelers, but has 150 lb. capacity, so it should be fine for carrying a tire. Roadside assistance? I'm sure they could bring you one if need be.. Allows you to carry a mounted spare and still have use of the hitch for other things (like towing). Also carries the spare higher and closer to the vehicle where it is less likely to get hit or cause problem when turning up a steep driveway. A simple metal rim wouldn't be that expensive, so if you went with a rack like this you could get that spare mounted. Now just think about this. You are in the middle of nowhere and you have a flat. What good would it do to have a spare tire without a rim? Would you have the tools to dismount the old tire, mount the spare tire and air it up? Wouldn't it better if you are carrying the spare tire on the rack to carry a complete tire mounted on a rim? Then in the middle of nowhere you could at least change the tire and get back to the middle of somewhere? If you are that far out it would be hard to get Roadside Assistance to find you. Now just think about this. You are in the middle of nowhere and you have a flat. What good would it do to have a spare tire without a rim? I agree with you for a tire of this size. Makes no sense to carry an unmounted tire, and a mounted tire would probably be easier to attach to a vertical rack in this situation. However, there are some driving larger coaches & bus conversions that do carry unmounted spares. Usually it's because they don't have room to load a mounted spare, and sometimes it's because a mounted spare is much heavier and more difficult to get into the storage space. My mounted spare is almost 200 pounds and it's all I can do to get it in/out of its storage area behind the front bumper. The way it was explained to me is that it will be relatively easy to find a remote tire service shop anywhere even remotely near a highway. They'll be able to mount the tire in the field easily. What they won't be able to do as easily is bring a replacement tire, especially for a less common size tire. Even with a mounted spare, I'm going to be calling for assistance. No way I'll have the physical ability to safely change a tire on our rig - don't think I could even get the lug nuts loosened. My assumption is manufactures figure that since nearly no one is changing their own tires nowadays, it made no sense to take up space with a spare that could be used to provide more bells and whistles. After all, bells and whistles probably sell lots more rigs than things like spare tires. Some may be surprised to find how many new cars do not come with a spare tire anymore! I drove a Kia Soul 14 months before I found out there was no spare tire, came with a jack, lug wrench and a can of fix a flat. I agree with Richard and Herman and others, I do not want to be without a spare. My bus has the spare behind the front bumper like Richards with a mounted spare almost always there. The carrier that Richard posted looks great for those without another place to carry one. By the way Richard, I placed a ratchet strap inside the tire bay for loading and unloading the spare, works great. My Discovery didn't have a spare and I have never gone anywhere without one on all of my motorhomes in the past 48 years. I made a rack under the propane tank and have an electric winch to hoist it up into place. ...By the way Richard, I placed a ratchet strap inside the tire bay for loading and unloading the spare, works great. Good suggestion. It would be better than the piece of flimsy rope I have on there now. I think the weight of the thing is only half the problem - the other half is that the spare is a 315 tire like all my others, but the compartment is sized for a 12R22.5 and doesn't have much room to spare. Once I get the proper tires on things should be at least a tad easier. If the OP is thinking about getting a wheel to mount the spare on, it doesn't need to be anything special. The dealer would of course be one option but will probably be top dollar. Any good tire dealer should be able to get an inexpensive plain steel rim with the proper size and specs to accommodate the tire. 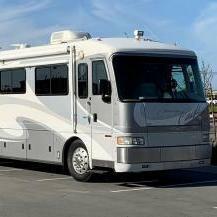 I have a Class C Winnebago Itasca Cambria 32 ft. 2014. We have a spare on a steel rim in the hatch back storage area. Some time in the fall we had to remove the inside dual rear tire, because of a broken valve stem. We have Aloca Mags on the outside wheel positions. Make sure if you call for a AAA service make sure to explain you need a big truck with air tools. Those nuts are set at 150 lb-ft? I have never check the spare tire for air pressure 20 PSI is a long way to 80PSI. SO, if you have a space check its tire pressure. No good having a SPARE if you have a FLAT as one. SO when you check tire pressures include all tires that being a spare. I was lucky they have air on there RIG..
My stems are solid metal stems. Since my spare is so difficult to get to, I took the air pressure thing one step further. I ordered an additional TMPS sending unit from TireMinder and installed it on the spare. Now I can check the spare along with all the other tires. Our wheels are torqued to about 500 ft-lbs. No way I'm going to even get those to budge without pneumatic tools. It's cute that they issued tire changing tools with the bus from the factory, but I can't imagine them ever being all that useful. It came with a lug wrench, bottle jack, and run-up ramp. I have always had a tpms transmitter on my spares. When I had a class "C" I was lucky that it had a spare. I would absolutely recommend all class "C" owners weigh their coach. I found that the one I had built on a Ford cutaway chassis still had standard van light truck tires. After the conversion was done it was way over weight for the original tires. I upgraded to load range "E". So how are all the post about spares and location on your bus helpful to the OP in a class C forum? When we traveled in the outback with our jeeps for many years we carried a tire repairs kit and air compressor. We could actually repair most tires, at least long enough to get back to a tire service shop for permanent repairs. 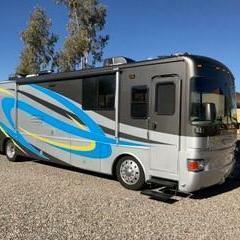 Not sure how tire repairs would go on a class C motorhome, but depending on the tire damage or puncture it might just be handy to have a kit. It also seems possible that you could get a mount for a rear bumper to mount a spare too. In addition, I have even seen spares mounted to RV rooftop. Here is what it looks like mounted on RV. It is spare tire only (no rim) w/cover, and a storage box for sewage hoses & parts, rather than keep those smelly items in the RV's basement. I had to move my license plate, as it was blocked by rack items. I even lighted it! 😃 (to be perfectly legal). I used a license plate frame that was in the glove box for the front of the vehicle. Well, I can see where your stuff can learn to walk real quick! Hey, how does one hook up their toad with that rack in the way? Ian, I don't think he has one! I traveled all over the US without a toad or scooter, for 14 years...but then, that was in the late 1960's & 70's! Today, no matter the size or class of rig, I will not travel without a secondary mode of transportation! 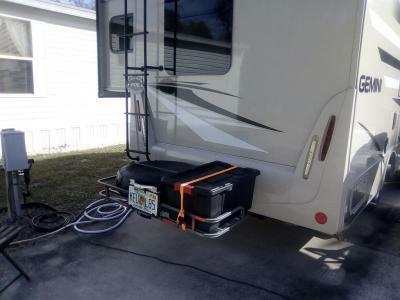 There is a vertical version of a rack similar to that which can be mounted on a pass-through hitch. Allows for attaching a trailer behind while still carrying the external gear. Not sure how it would work, but the specs seem to indicate full towing capacity maintained. My friend pulls his toad with a dual receiver hitch adapter. His rack sits around 12” above his tow bar and the car clears the rack when turning. Yeah, we never leave home without our toad too! As far as spare tire, it is easy enough to steal one from an RV back wall otherwise. It has no rim.